Don’t let the severe name scare you, this delicate tea is packed with health benefits that reduces inflammation, helps manage diabetes, as well as fight the nasty flu bug going around. Skullcap, a part of the mint family, is an herb that produces delicate flowers that range from blue to pink in color. For years, it has been used in traditional medicine to treat headaches, reduce inflammation, and reduce fever. Found primarily in the wetter regions of America, skullcap is an herb that can be enjoyed in a number of ways, but is most readily available in the form of a tea. It should be noted that there are actually two types of skullcap: American skullcap and Chinese skullcap. Each type offers its own unique set of benefits, so take that into consideration if you’re looking for certain benefits. Initially skullcap was used to treat rabies in the 19th century, however, common sense and the advance of medicine dictate that you should go to the hospital and receive a rabies vaccination. While it is no longer considered an effective cure for rabies, many people have found that sipping on a calming cup of skullcap tea provides many other health benefits. If you’re looking to kickback after a tough day or want a natural way to help reduce minor anxiety, skullcap tea is a great alternative. Skullcap tea helps to balance out of whack hormones. Skullcap tea has also been found to help stimulate endorphins, which helps to alleviate depression and facilitate feelings of well-being. A benefit to the anxiety-reducing affects of skullcap tea is that it helps to facilitate sleep. Those who suffer insomnia as a result of anxiety will find that enjoying a nice warm cup of skullcap tea helps to calm frazzled nerves and reduce anxiety, creating ideal conditions for sleep. As you sip on skullcap tea, your muscles will relax, breathing will relax, and anxiety melts away. The anti-spasmodic effects of skullcap tea can help soothe a nervous system in distress. Regularly drinking skullcap tea as well as drinking enough water has been found to help alleviate the symptoms of nervous disorders. Drinking a cup of skullcap tea can help reduce inflammation in the body. Reducing inflammation helps to reduce symptoms associated with inflammatory bowel disease and arthritis. Some studies indicate that reducing inflammation may also help to prevent the development of Parkinson’s disease and Alzheimer’s disease. More testing needs to be done to determine skullcap herb’s ability to prevent the onset of these conditions. Reducing inflammation also helps to provide pain relief. If you are looking for more localized pain relief or are looking to quickly heal a bruise, skullcap herb can be applied topically. Skullcap’s ability to stimulate blood flow not only helps to expedite healing but also prevent infection. If you are looking for a way to help maintain insulin levels or are adjusting your diet to reduce the symptoms of your diabetes, consider adding skullcap tea to your diet. Some preliminary studies have found that skullcap tea help to regulate insulin and glucose levels, helping to keep diabetes in check. Skullcap tea has also been found to benefit overall health by reducing cholesterol. While these preliminary studies are promising, more rigorous scientific testing is needed to back up these results. Always seek the advice of a medical professional when treating diabetes. As mentioned, regularly consuming skullcap tea may help to reduce cholesterol levels. By keeping cholesterol levels in check, you lower chances of developing atherosclerosis, heart disease, heart attacks, and strokes. You also help to keep your arteries clear of plaque, which can have severe health consequences. More testing needs to be performed, however. The antioxidant abilities and detoxifying nature of skullcap tea can help to improve the health of your liver. By boosting the antioxidant activity of the liver, you help the liver filter out toxins and prevent it from becoming sluggish. Keeping the liver healthy and functioning well benefits the overall health of the body. It helps to reduce toxins levels in the body as well as keep the blood pure. 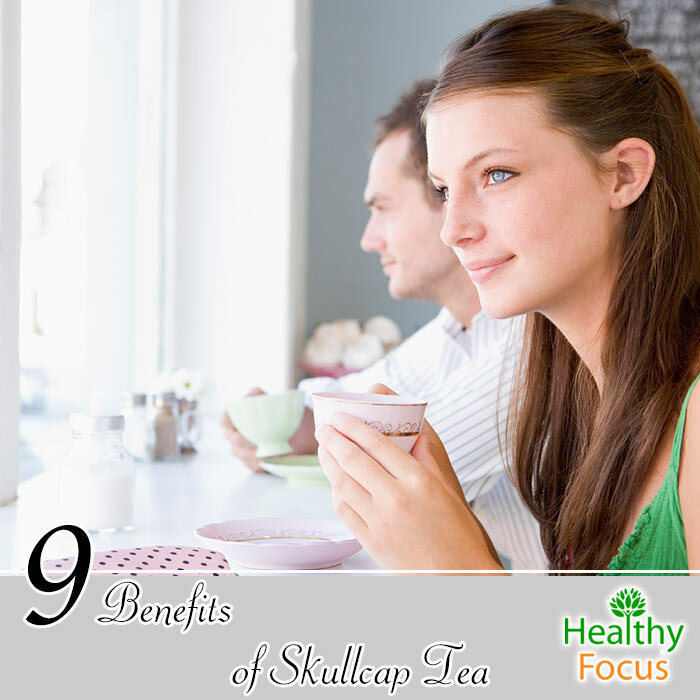 Enjoying a cup of skullcap tea everyday is a great way to maintain your overall health. Another benefit to reducing cholesterol levels is that it helps to maintain a healthy diet and aid in weight loss. When paired with a healthy diet and regular exercise, skullcap tea is a fantastic way to help maintain a healthy weight. If you are looking to create a diet that keeps you healthy and helps prevent the onset of cancer, consider trying skullcap tea. Some studies have found that skullcap kills off cancer cells, also known as apoptosis. This helps to prevent the spread of tumors and cancerous cells. The antioxidant content of skullcap also helps to prevent the development of cancer. Antioxidants seek out free radicals roaming the body and neutralize them while helping to reverse any damage done to healthy cells. Skullcap tea should not be used in the place of traditional cancer treatment and should be treated as a supplement to prescribed medicine. Skullcap tea should not take the place of medical treatment or medication. Consult your physician before incorporating skullcap tea into your diet or treatment routine. Skullcap herb may cause an allergic reaction in some people. If an allergic reaction does occur, discontinue use and consult your physician. Skullcap herb may interact with other medications or supplements. To prevent a dangerous interaction from occurring, consult your physician. Women who are pregnant or breastfeeding should avoid skullcap herb. There is currently not information to determine the safety of this product. Always purchase skullcap from a reliable source to ensure safety and to avoid a contaminated product. At one point, American skullcap was contaminated with germander, a group of plants that has been known to cause liver problems. If you are considering taking Chinese skullcap herb, be advised that this particular type of skullcap causes blood sugar levels to drop, which can increase your chances of developing hypoglycemia. For this reason, those suffering from diabetes should avoid taking Chinese skullcap. As always, to avoid any other health issue, consult your physician before taking either American or Chinese skullcap. When taking skullcap, be sure to follow the dosage directions provided on the package. Taking too much skullcap can cause some side effects, such as nausea and dizziness. If you are scheduled for surgery, stop taking skullcap herb at least two weeks beforehand. Skullcap is believed to slowdown the central nervous system, which can have dangerous effects when paired with anesthesia used during surgery. Skullcap should also be avoided at least two weeks after surgery.